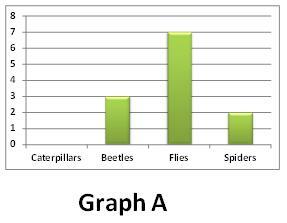 This worksheet offers students to opportunity to use block graphs as a way of looking at how to display the results from a habitat survey, interpreting what they show about what lives where. 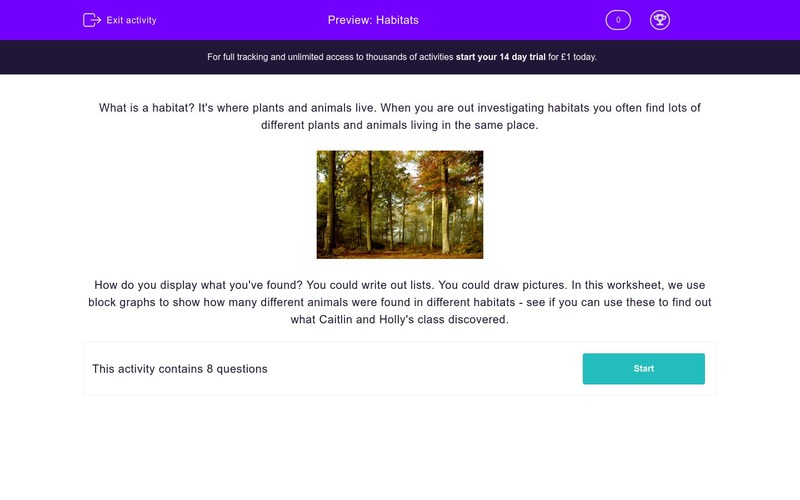 What is a habitat? It's where plants and animals live. When you are out investigating habitats you often find lots of different plants and animals living in the same place. How do you display what you've found? You could write out lists. You could draw pictures. 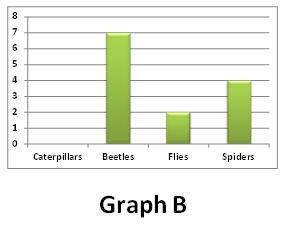 In this worksheet, we use block graphs to show how many different animals were found in different habitats - see if you can use these to find out what Caitlin and Holly's class discovered. Caitlin and Holly's science class spent the morning outside discovering about a local habitat. They recorded the names of some of the plants and animals they found there. Look at the graph - how many snails did Caitlin and Holly find? 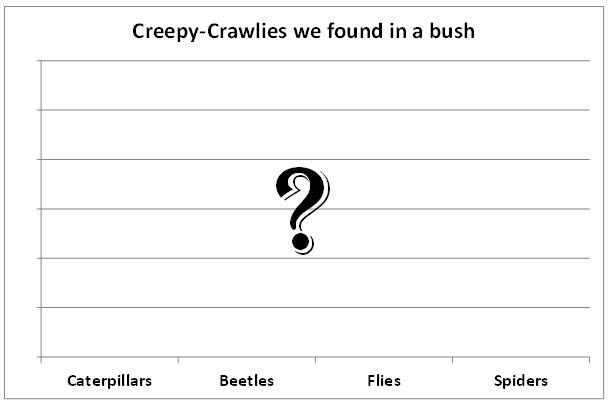 Look at the graph - how many ants did Caitlin and Holly find? 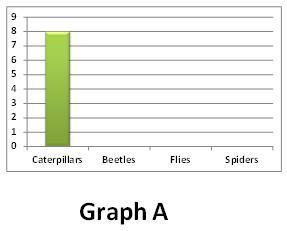 Look at the graph - which was the most common type of animal that Caitlin and Holly found (the one they found the most of)? Think about the different sorts of animals that Caitlin and Holly discovered. What sort of habitat do you think their class visited where they found those animals living? Think about where in the habitat Caitlin and Holly would be most likely to find woodlice, beetles and snails. What sort of place do you think that might have been? Caitlin and Holly had real fun investigating their habitat, so they decided to find out about the sorts of animals that live in one of the bushes in their school garden. They spread out a white sheet underneath the bush and gently shook the branches of the bush. Some animals fell out on to the sheet. They found 8 CATERPILLARS. Which of these three graphs shows that correctly? Caitlin and Holly found more beetles than flies on their sheet. 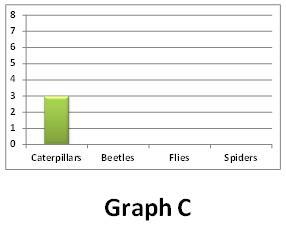 They also found more flies than spiders. Which of these three graphs shows this correctly? Why do you think that Caitlin and Holly found no woodlice living in the bush? If you look carefully you can see that the green block for snails lines up with the '3' on the scale on the left hand side - so Caitlin and Holly found 3 snails in their habitat. If you look carefully you can see that the green block for ants lines up with the '6' on the scale on the left hand side - so Caitlin and Holly found 6 ants in their habitat. Which is the tallest block on the graph? 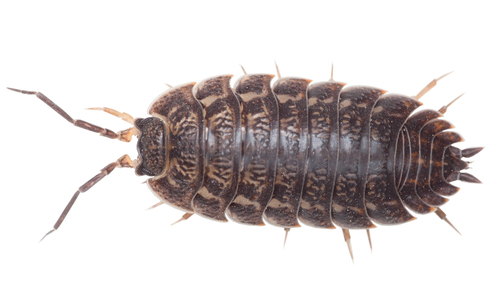 The one for woodlice - that reaches the '7' mark, more than any other animal. 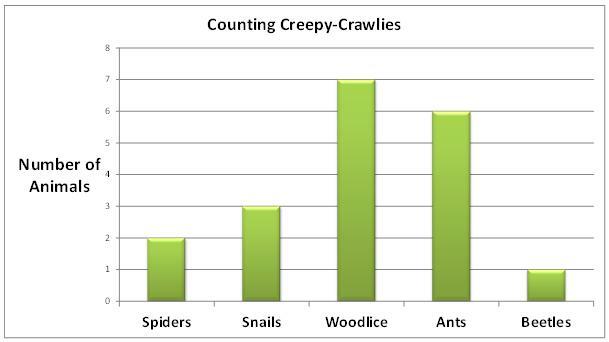 So woodlice were the commonest type of animal they found. These animals would be very unhappy on the beach - the wrong sort of food and way too salty! They might have been in the playground, but there's not much to eat for many of these animals, so there won't be as many there as Caitlin and Holly found in the wood. 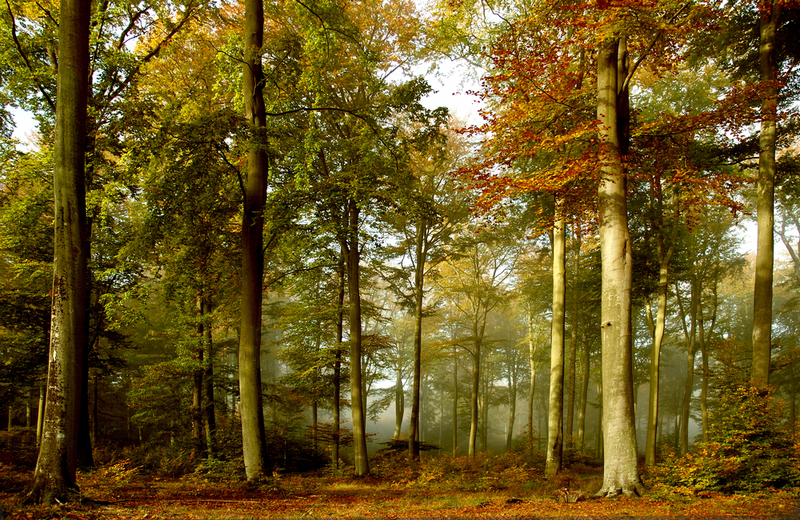 In the wood there are many plants to eat and that means lots of creepy-crawlies for spiders to capture! Bet you they found woodlice, beetles and snails UNDER things like logs and stones! Those places are damp and dark - just the sort of place those animals like to live, so they can't be seen by birds that might eat them, and somewhere where their bodies won't dry out. 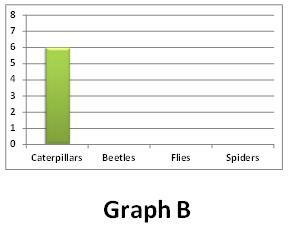 If you look at Graph A you can see that the green caterpillar block goes up to the 8 mark on the scale on the left. 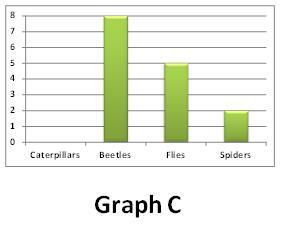 If you look at the three graphs carefully you can see that Graph C shows more beetles (8) than flies (5) and more flies (5) than spiders (2). Woodlice are usually found under things like logs and stones where they stay damp and hide from things that might eat them, like birds. They eat any plant material, including wood.